You only get one chance to make a first impression, so it's essential that you have the right design to catch the eye. It's a wise investment then to recruit a competent graphic designer who can make an impact and reflect your business' professionalism. Creative excellence is integral to the success of your business or business campaign. By adding creative value to your business, you will connect more to your potential and existing customers and they will be more likely to do business with you instead of one of your competitors. A graphic designer's main purpose is to present information in a way that is both aesthetic and accessible to the viewer. It is about communication and the transfer of knowledge to customers. Designers use a combination of images, text, and graphics to produce a unified and effective design based on your brief. Familiarity of a brand generates trust, therefore the more you invest in a good design and brand, the easier it will be to retain and expand your client base. 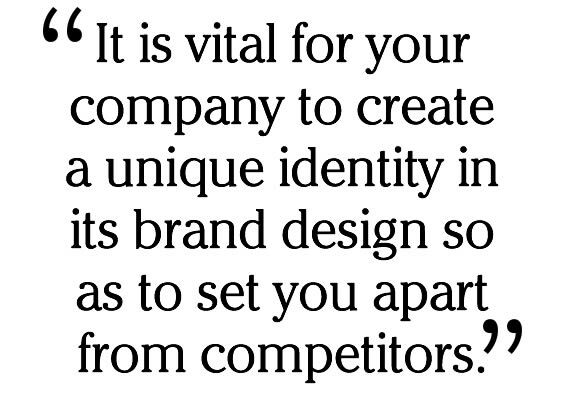 "It is vital for your company to create a unique identity in its brand design so as to set you apart from competitors." If you are setting up a new business, it is very important to create a brand for your company as this is how to get people to remember your business. It is vital for your company to create a unique identity in its brand design so as to set you apart from competitors. A brand should embody all the information connected to your company, including your values and personality. You need to brand the identity of your company visually and this requires investing in a graphic designer as they have the crucial expertise and creative process which will produce an effective and unique identity. Branding is not simply about colour, shape or form, it is also a psychological process of understanding what appeals to potential clients. Remember that your brand design needs to be able to work on all forms of marketing materials, including your website, business stationery, product packaging, and brochures. Sourcing a good designer or agency can be difficult as there are innumerable graphic designers with various levels of skill and experience. A lot of graphic designers come and go, so it's important to select a designer that has the required skills, and more importantly will be in business for the long term. You will still have to choose one company to work with, so here are some things to consider. The greatest resource available for researching a graphic designer's aptitude and suitability for the kind of work you have in mind is the portfolio of jobs they have done in the past. Qualities to look for include variety, originality and whether you consider the style of the designs effective for the businesses in question. Also, you must consider whether you like the designer's style and would like it to represent your company's brand. This seems obvious, but you must give thought to this as if your preferences are very different, it may give rise to many problems later on. If a designer's portfolio is large then this shows he has many clients and has lots of experience. Any graphic designer or agency should be happy to provide you with a list of satisfied clients as references. This is possibly the most important step in choosing the right company to work with as talking to past clients will give you an idea what the company is like to work with in practice. There are a number of questions worth asking referees. How well did the designer communicate with the clients? Did the designer deliver what was required within budget and to schedule? How did he act under the pressure of deadlines? Have the designs stood the test of time? Is the designer dynamic and adaptable enough that alterations to the design can be made without difficulty? You will likely find that there are all sizes of organisations available for your project, from freelance individuals to multinational corporations. Which is best depends on you and your project and there are advantages and disadvantages to either. While a freelancer will probably give you a very high level of personal service, they may not personally be able to take on all of your tasks. Freelances tend to transient in the industry - so be careful. Smaller design studios usually offer exceptional design services, as small to medium clients are their mainstay. Smaller studios have less overheads than larger design companies - reflecting in their price structure. Also small design studios are usually a registered business, so there is a commitment to succeed and expect to be around for the long-haul. Large companies offer stability, capacity and guarantees, but you may not receive such personal service, especially if you are a relatively small client. Additionally, larger organisation employ a team of graphic designers, so often they can offer a range of design concepts from different designers. The down size is, that you may like the designers work, but they may leave the company and you are stuck with someone else doing your designs. Ultimately, you should be confident that the individual or company you choose can provide you with high quality work and the level of service you want. Make sure that you meet the individual project manager and the designer who will be working with you on your project and ensure that you get along well with them before employing their services. Also, request their own portfolio so you will see their individual style and experience. It may seem obvious, but having a good working relationship with your designer is vital. You will inevitably need to communicate a lot and effectively in order to achieve the result you want, so you must feel comfortable with them. It's no good having the world's most sought-after graphic designer working for you unless you feel able to tell them that they've done something wrong or that you don't like something they've created. A designer should be able to take constructive criticism and suggestions and be generally personable. Compatibility between client and designer is key to generating the best possible end result. As graphic design can extend to a wide range of disciplines, it is vital that you research graphic designers to make sure they have the expertise in the graphic design area you are looking for. For example, some graphic designers focus mainly on website design, so if you are looking for a graphic designer to design a brochure or logo for your company then you should not choose them. You want to choose a graphic designer that understands your business sector. This will help you get the most effective design for your desired audience as the designer will have a knowledge and understanding of the type of customers you are targeting and how your sector operates. If you have a small budget, it may be advisable to look to individual or freelance designers as they should charge less than using a large design agency. Likewise, if you are looking for a graphic designer to design mainstream adverting campaign, it may be best to use an agency as they will have more support and will be better handled to manage multiple and more complex designs at once. Always ask for a quotation or cost estimate for the design project before authorising the go-ahead - that way there are no unexpected surprises!